Laparoscopic cryoablation is ideal for small volume renal cortical masses, suspicious for renal cell carcinoma, less than 4 cm (Table 1). Contraindications to renal cryoablation include locally advanced and/or metastatic disease and uncorrected bleeding disorders. 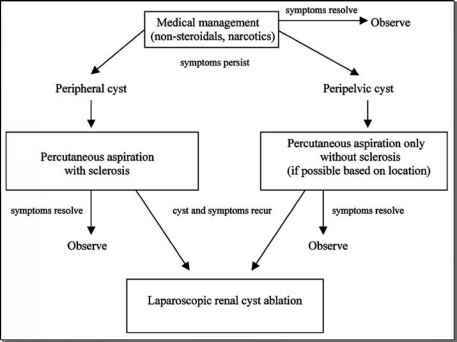 Laparoscopic or percutaneous cryoabla-tion should be approached cautiously in patients with renal lesions close to renal hilum and pelvicalyceal system. However, Sung et al. showed intentional freezing of collecting system did not result in urinary leak (24). Intraoperative ultrasound should be performed to rule out multifocal lesions where multiple probes or an alternative treatment modality (i.e., open or laparoscopic radical nephrectomy) could be considered. To some, cystic renal masses are not ideal for renal cryoablation secondary to decompression of cysts, which might lead to instability of probes and imperfect freezing.